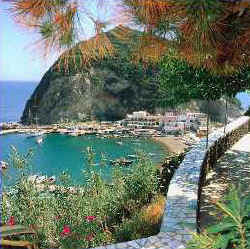 Ischia is the biggest island in the Gulf of Neaples. It is a volcanogenic island and it is constantly altered by quakes generating thermal and radioactive waters, Ischia is so famous for worldwide. It comprises six town councils: Ischia, Porto, Casamicciola, Barano, Lacco Ameno, Forio and Serrara Fontana and it is characterized by a beautiful and varied coast, with wonderful beaches, coves and ravines that make it really fascinating. Rocks dominate this island's shoreline but they have also helped create many beaches: Ischia Port: English Beach - sand and rock; Casamicciola: Bagnitielli - sand, Marina - sand; Lacco Ameno: Between Casamicciola and the Mushroom Rock - sand, Bay of San Montana - sand; Forio: San Francesco and Chiaia - white sand, Cava dell'isola & Citara - sand; Serrara Fontana: Cava Grado - small sandy inlet with thermal sea water, Sant'Angelo - sand; Barano Maronti - shingle on the shoreline, sandy inland. It is the largest beach on the island almost 2 kilometres long with pumice stone cliffs. The seawater here is thermal, going towards Sant'Angelo one can find the steaming geysers (fumaroles). Nitrodi - hat springs. From this point the coastline to Ischia Ponte is rocky. Ischia Ponte: Cartaromana - sand, Pescatori - sand. The thermal waters of Ischia have really become the gold mine of the island. Angelo Rizzoli (Cavaliere del Lavoro 1888-1970) launched Ischia onto the international tourist circuit in the 1950's and 60's by building luxury hotels with spas included creating the slogan " Ischia the island of eternal youth". Therapy for rheumatism, arthritis, obesity, gynaecological conditions and the nervous system are available on the island. The hotel structures have recently developed a tourism of health and beauty with health, deintoxication and beauty centres which have created much interest in the American market. It is only on Ischia that one can find thermal gardens with pools at different temperatures, from 28 to 40 degrees centigrade, close to the sea and allowing one to have various treatments. The largest thermal complexes are in Casamicciola - "Castiglione", Lacco Ameno - "Negombo", Forio "Poseidon", Sant'Angelo - "Tropical" & "Aphrodite" and Ischia Porto "Edon". These complexes open early April and close end October and are visited by an international clientele of all age groups. One of the oldest traditions of the island of Ischia is the folk dance called "N'drezzata" literally translated "Entwined". It is composed of 18 male dancers, four musicians ( two clarinet players and two drummers) who keep time in this dance of antique origins. Only residents of the village of Buonopane, in the Borough of Barano can become members of this dance troupe the secrets of are passed down from generation to generation. The 18 dancers, led by the "Corporal" who recites a speech in an old Napolitan dialect, form two circles of 9 dancers. Each man holding in his right hand a short wooden staff and in the other a small wooden sword: on the "Corporals" order and in time with the musicians, the dancers whirl and entwine amongst themselves at the same time 'fighting' with each other, almost destroying the held wooden instruments. There are 289 hotels on the Ischia island with a bed capacity of 40,000, private renting is also popular. A third of the Campania areas tourists are accommodated here. In 1989 more than 4 million (60% of which foreigners) visited the island. Annual profit exceeds 500 million lire and some 6,000 people are employed in the tourist business. More than 70% of the 289 hotels have thermal spas and 122 are covered by the Italian National Health Service. Recent studies have shown that the island of Ischia has been inhabited since pre-historic times. Flint and volcanic glass instruments dating from 300BC have been found in many inland areas, along with Bronze and Iron Age ceramic fragments. Due to underwater volcanic activity, Ischia emerged from the sea, one night, in an era unknown even to geologists. The first clod to emerge was the peak of Mount Epomeo, further eruptions causing the other "mountains". Today, fortunately, volcanic activity on the island is limited to the presence of its thermal waters and numerous steam geysers with temperatures that can reach 106 degrees centigrade. In the area of San Michele fragments of vases concealed under volcanic ash, belonging to the Neolithic age have been uncovered, thus proving man's presence in this period. There is also evidence of Bronze and Iron age settlements. The Greeks were the first to settle in the Monte Vico area of Lacco Ameno naming the island "Pithekoussai", its position being ideal for their commercial trade in the eastern Mediterranean. Later the Romans changed its name to "Aenaria" and appreciating greatly the benefits of its springs and thermals waters, erected many temples particularly at Nitrodi in Barano. After the fall of the Roman Empire Ischia was invaded by various Barbarian tribes. The island was first called "Insula" as recorded in a letter sent from Pope Leone lII to Carlo Magno in 813 altering throughout the ages to Insla, Isla, Iscla and finally Ischia. With the end of the Ducy of Naples the island passed under the dominion of the Normans, Swedish, Agevin and Aragons. Following the eruption of Mount Trippodi in 1301 its inhabitants flied to the mainland and four years later ventured back to the Castle. In 1320 Robert of Angevin visited the Castle, accompanied by his wife Sancia di Majorca. With the new dynasty started by Alfonso I of Aragon, the Castle became a fortified and unconquerable city.